Following Route 646 for approximately two miles, we turn left onto Route 54, Patrick Henry Road (unmarked), and almost immediately turn right, back onto Route 646, St. Paul's Church Road. 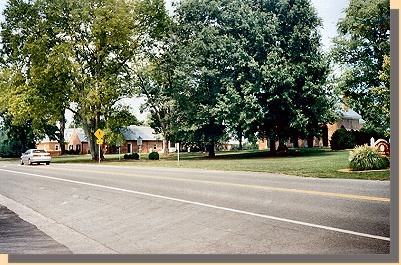 We then turn onto U.S. Route 301 / State Route 2 at Hanover Court House. 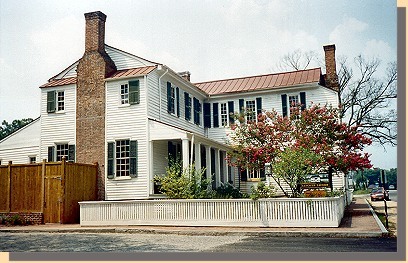 We park in the Hanover Tavern Parking Lot, almost immediately on the right and across from the Court House. A Civil War Trails sign marks the entrance to the parking lot. It was here that Stuart's forces had their first encounter with Federal troops. The 6th U.S. Cavalry under Captain J. Irvin Gregg had just entered the town in order to rest. Stuart sent Fitz Lee and the 1st Virginia Cavalry southward to cut off the Federal's retreat and then entered the town with his main force. The Federals quickly mounted and fled down Richmond Stage Road (now State Route 301). upper left, to Linney's Corner, lower Right. Heading south on 301/2, from Hanover Court House, less than one-half mile, we cross over Mechum Creek. 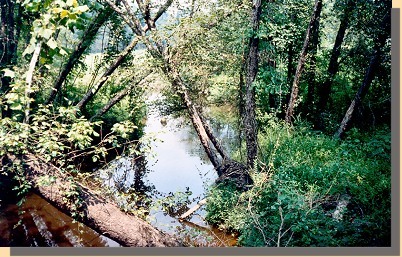 The swampy area at Mechump's Creek prevented Fitz Lee from cutting off the Federal retreat. They did manage to catch a straggler and Stuart sent him back to his unit with a note for the 6th U.S. Cavalry Commander stating his desire to meet the Sixth Cavalry in a fair hand-to-hand fight some day.